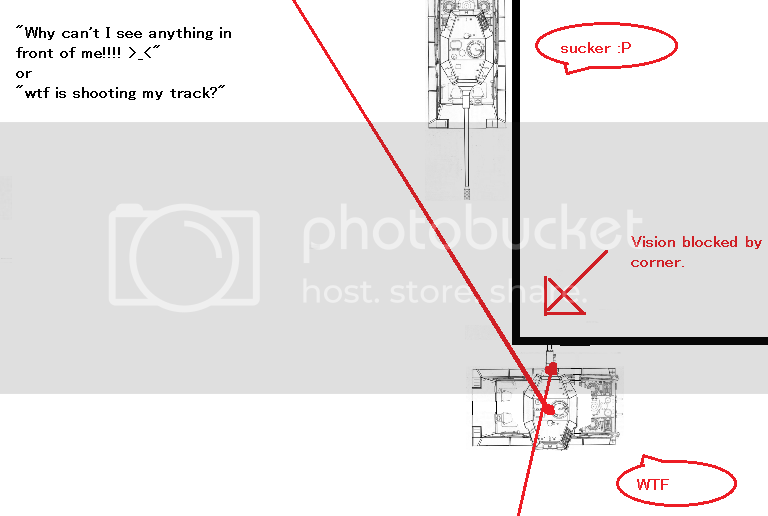 How the spotting mechanics work. The base of your barrel, the mantlet. Top of your turret center, commanders cupola. The game draws lines, or ‘rays’ from the two vision nodes to 6 points on enemy tanks. Front center hull, rear center hull, front mantlet, top turret, side turret right/left. If Any of those lines connects without anything in the way or camo reducing efficacy then the target is spotted till all vision checks again fail on the target, with the target remaining lit for about 5 seconds after checks fail. Make Note: (mostly because of the top of the turret spotting node) Hill tops provide little vision cover, you often can see ‘through’ the tops of hills. If you can draw a line from the tippy top of your turret, to the tippy top of an enemy turret on the other side of a hill, even if it goes through a little bit of ground, you will likely light up each other. 50m is the minimum distance, that once two targets are within 50m’s they see each other regardless of cover or anything between them. That means you will see targets within the max 500m better, vs their camo rating. This will be explained more later on. 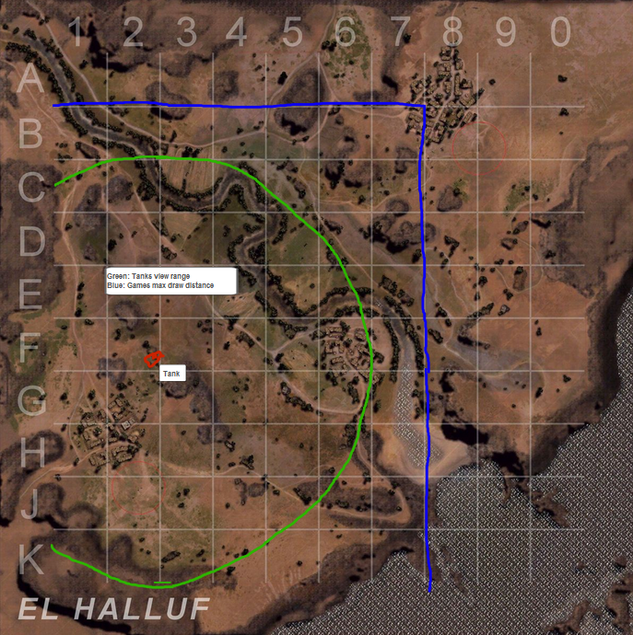 Since WoT 7.1 Optics and Binoculars do -not- stack. 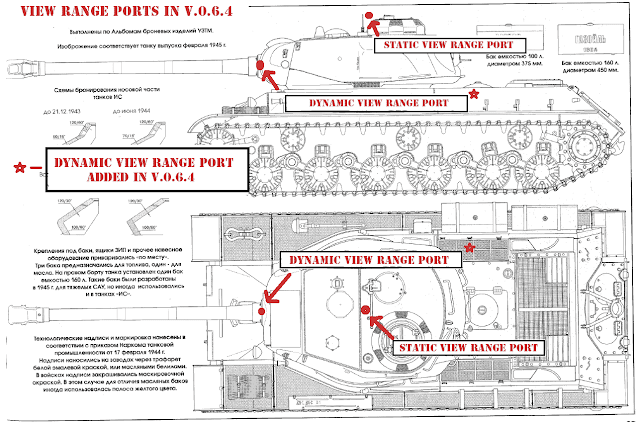 World of Tank’s game engine’s max draw distance is 500m in the four cardinal directions and due to computer programming ease it is based on a square. The following image shows how this works if your confused. 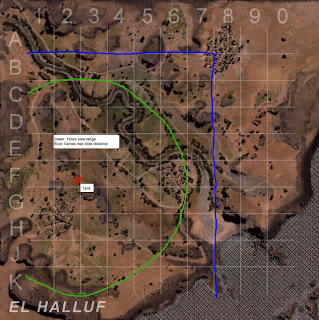 The map El Halluf is 1000m by 1000m, each grid square 100×100, the tank has about 400m view range, and from it’s position what it can see is drawn out in green, with the games max draw distance and thus what he will see lit up from allies drawn in blue. 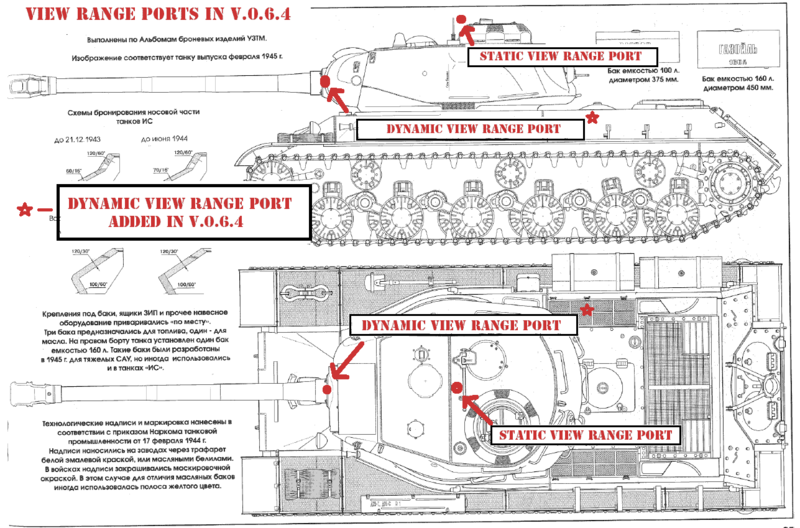 In other words, the tank draw area is a square that is 1000m by 1000m square centered on you. The game does vision checks semi-often, distance determines how often it is checked. Sources point to the idea that the game alternates using each vision node. One check with the mantlent, then the next with the cupola, back and forth. All camo values are recursive percentage reductions in enemy view range when trying to spot you, and only you. 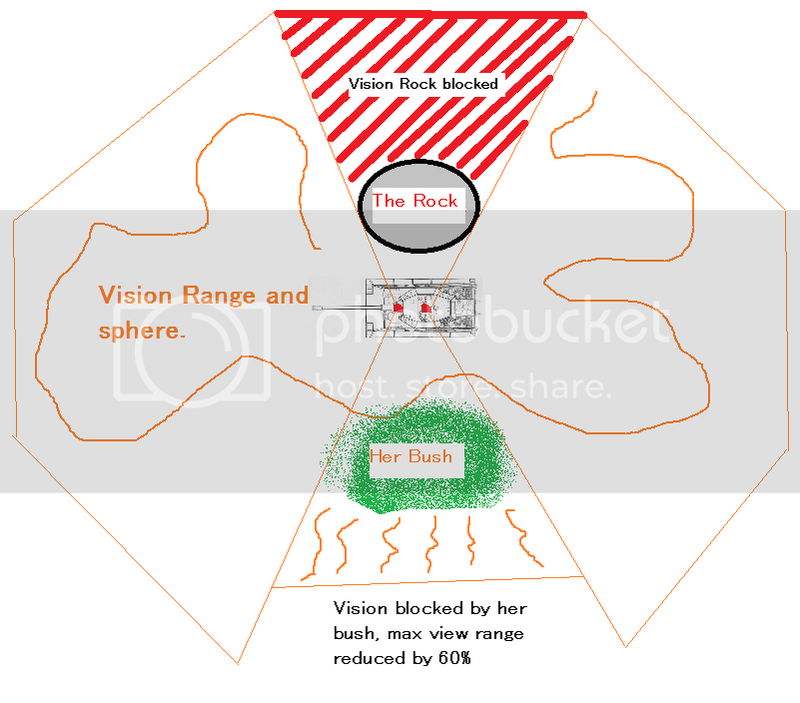 Bushes provide anywhere from 5%-65% cover per bush between you and spotters, that is a 5%-65% reduction of enemies spotting distance when trying to see you. Good bushes are higher on that spectrum, burnt bushes/no leaf’s are at the bottom. Bushes average 60% camo, with tree’s averaging 35%. When you are within 15m of the center of a bush, you can see through the bush, it will not obscure your spot checks to see any tanks through it. one way to check to see if you are within 15m of a bush is in first person mode. If you are greater then 15m from a bush it will be opaque. If you are closer then 15m to a bush, it will become semi-transparent, the closer you move the more transparent the bush becomes. the moment you see the bush start to become semi-transparent, you are within the 15m amount to see through that bush. Tanks have two innate camo ratings. One for when the hull is at rest, and one for when the hull is moving. Moving the turret or cannon has no effect on this. When you fire your cannon, your tank loses about 75% of it’s current Camo rating. It varies based on cannon size and if the cannon has a muzzle brake. Bushes within 15m will provide no camo cover for you for 5 seconds. that is enemies can see through your bushes for 5 seconds. Sources point to the idea that the bush with the greatest camo rating will still provide cover ilregardless of firing. 100% camo crew doubles the tanks innate camo rating. camo nets add 25% more off the base camo rating, so more stealthy tanks get a bigger boost. so a Hetzer, with a camo rating of 30% at rest will with a full crew be 60% camo. 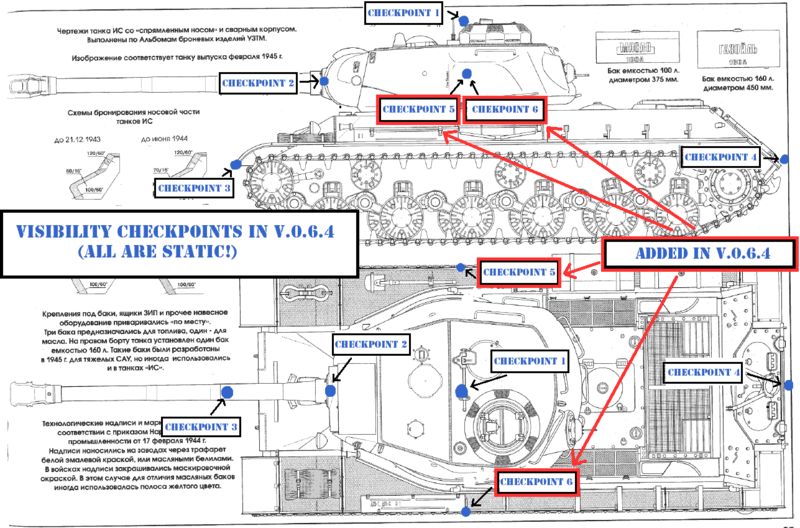 that is a 60% reduction in enemy view range when trying to see the Hetzer no matter what. 500m – (300m) = 200m! 500m – (400m) = 100m! now behind a good bush! 100m – (60m) = 40m! then round it up to 50m minimum. say a maus with binocs. 625 – 375 = 250m! Is to have someone with great camo, binoculars, and a net, move to take a bushy over-watching position, where he can see much and be behind bush cover. Now he will NOT fire his cannon. but the other two players in the platoon take up positions say 50m back, and at least 20m behind more bushes; they fire at all the targets the scout lights up. since they are not loosing their bush camo cover when firing, they can fire all they want and never be seen by the enemy. 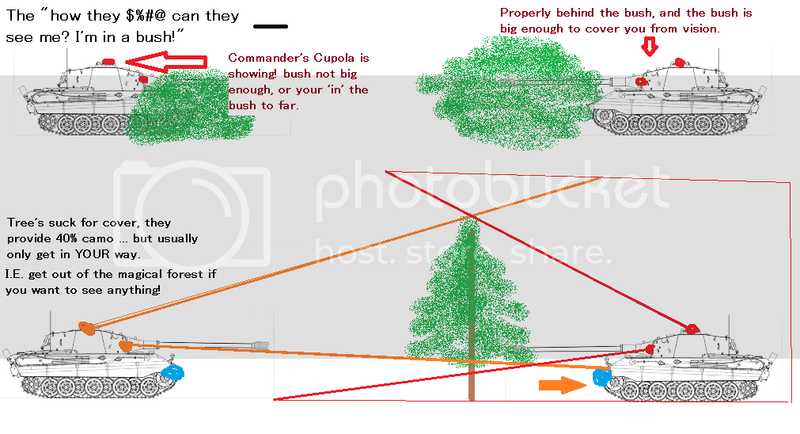 when they fire, they may light up like a christmas tree, lose 75% camo, but they still get the 60% camo cover from the bush, that means that even with the base capper’s having 500m view range, they will NEVER see the tank if he’s 200m away from them or more. 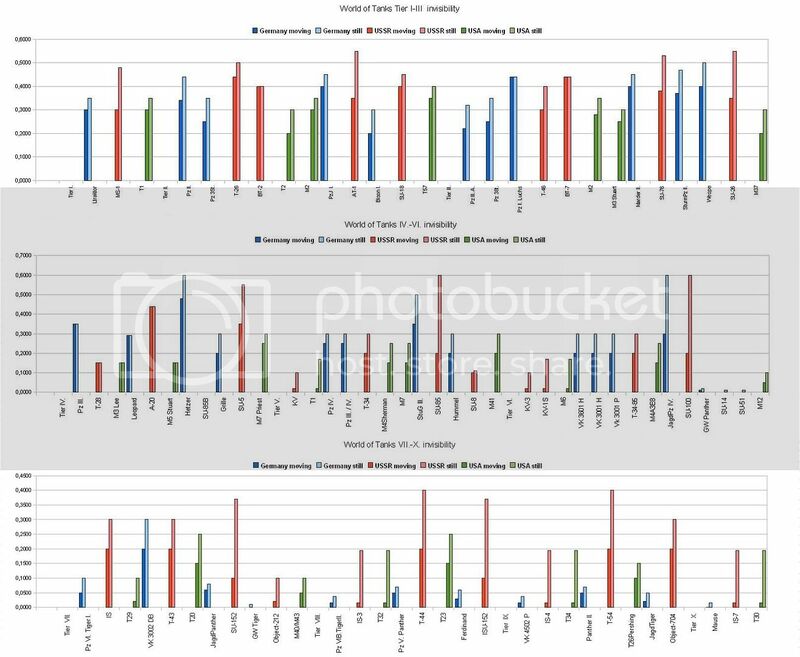 This data is outdated but still good for general comparison to see how much camo one tank has over another. the German data is most likely the least accurate since they have ‘patched’ it. Listed values are for 100% camo crew. Multiply the base by 1.25 to add the effects of a camo net. Situations that come up that catch people off guard! Stuck on corners and can’t see anything? Is that bush big enough? and what do trees really do?